Anna Du noticed plastic. It was scattered on the shoreline. She was walking along Castle Island’s beach. That's in South Boston. She reached down to pick it up. She quickly realized there were many more tiny pieces. There were more than she could handle. “When I realized how many pieces there were. It seemed impossible,” says Du. She was in sixth grade at the time. Du approached the problem like any good scientist. She did a little research. She learned that 8 million metric tons of plastic end up in the oceans every year. And there's an additional 150 million metric tons that are already there. Then she got to work. She built something that could help solve the issue. She built a remote-operated vehicle. It is called an ROV. Her ROV could move through water. It could spot plastics on the ocean floor. Du entered her ROV in the Broadcom Masters competition. It is a contest. It is for science. It is for technology. It is for engineering. And it is for math. These fields are known as STEM. It is for young students. Entries come from all over the world. The competition is organized by the Broadcom Foundation and Society for Science and the Public. It has been running for eight years. Nearly 5,000 students were nominated this year. They were in sixth grade. They were in seventh grade. And they were in eighth grade. They were nominated after competing in regional science fairs. Of those, 2,500 applied online for consideration. That pool was narrowed down to 300 projects. 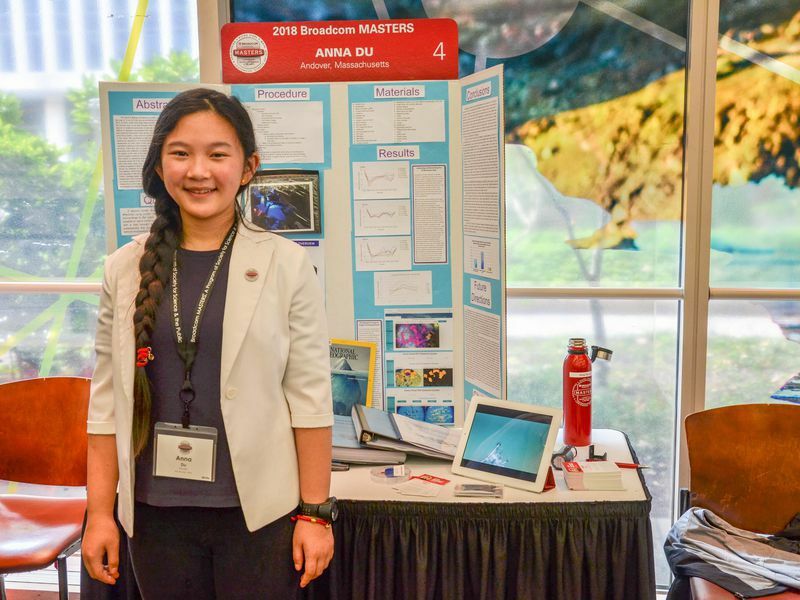 These were dubbed “Broadcom Masters.” The top 30 finalists gathered in Washington, D.C. They came to showcase their projects. The top prize was $25,000. There were other cash prizes as well. Du’s ROV is made with PVC pipes. It is inspired by ROVs of all sorts. It is like the Curiosity lander. Curiosity spies on the surface of Mars. It is also like the deep sea arctic Nereid ROV. It is at Woods Hole Oceanographic Institution (WHOI). Du’s ROV has two separate systems. There is a navigation system. And there is a detection system. The navigation system is pretty simple. It uses propellers to move through the water. It also uses a novel combination of fishing weights and foam pool floats. These allow it to move up and down. “The real invention here is the sensing.” That's according to Dana Yoerger. He is a roboticist. He is also an engineer. He works with WHOI’s Nereid. It is a ROV. It travels great distances in the arctic. It hosts a suite of sensors on board. These include acoustic sensors. It has chemical sensors. And it has biological sensors. Du was in awe of Nereid. She nicknamed her ROV Nereid Jr. Bt her vehicle has a different skill set than its namesake. “The ROV is nicely done for a 12-year-old and hers is quite clever,” Yoerger adds. The detection system is the “actually cool part.” That's according to Du. She uses a high resolution infrared camera along with three different kinds of light. These spot the plastic. Du’s detection methods are made up of two different wavelengths of infrared light. They illuminate the absorption spectra in microplastics. This makes them stand out from the sand. It also makes them stand out from plant life. She also uses visible light. This spots unnatural colors. These might make the plastics stand out. (Du was also one of ten finalists in the Discovery Education 3M Young Scientist Challenge this year. You can see a demo in her application video.) The apparatus doesn’t actually collect the microplastics. But it does identify where they are accumulating. She has applied for a patent. It is for the functional elements of the ROV. Du first read about the challenge of locating ocean microplastics. It is unlike the Great Pacific Garbage Patch. Microplastics are not floating on the surface. So she knew that an ROV would be the most efficient tool for the task. Taking buckets and buckets of water samples and analyzing them in a lab would not be effective. It could never be done to the scale needed. She needed a mobile lab. It needed to find the plastics in-situ. Du attends public events at MIT. She also goes to workshops. She has been going since she was five years old. She picked up the engineering skills necessary to build her ROV from these sessions. She got them from maker labs. These were at local libraries. She also learned from YouTube. She says actually getting her device to move through water well was tricky. It was even hard to choose the right kind of glue. It would hold the PVC pipes together. The ROV would flip over. This happened when she tried to move it up and down. This was before she added fishing weights. 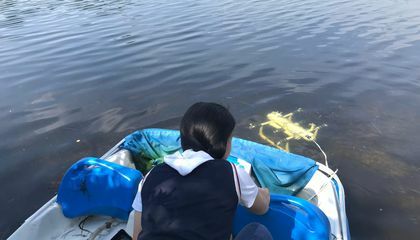 There was a lot of trial and error as she tested her ROV. She tested it in Boston Harbor. She was asked about future plans. She said she wanted to somehow address the effects of climate change. Du credits her parents for fostering and supporting her interest in STEM. They took her to MIT’s student outreach activities on weekends. She says she has been able to meet students and scientists there. As a result she has her sights set on attending the university. She wants to become an engineer. How do you think Anna's invention could be helpful on a global scale? It can help people realize that the environment is not a garage can. This invention could start some realization in peoples minds and they might help out. It could be helpful because scientists could eventually evolve Anna's invention to be able to collect and gather other harmful things from the ocean. It can also be helpful because it will, and or can greatly decrease the amount of pollution in the ocean. It can help the animals who live in the water such as fish, and more this can help the water we drink to be more filtered because there would be less filth than there is now. This is why Anna's invention could be helpful on a global scale. If we could have these ROV robots throughout the world, it would be a blessing. The oceans and beaches will stay clearer because of her inventions and not as much trASh because it will already be detected. The world and ocean would be a cleaner place with these Inventions around the world. We could detect all the plastic. I mean sure, it would take a while to at least make a little dent but it would be much faster than not knowing where it is at all.